Laurie Goldrich Wolf is a food writer, chef and recipe developer who has written or food-styled for just about every magazine ever written. She was born and raised in New York City. Because her mother was a“dreadful cook,” she and her brother developed a passion for good food by eating out. Since she had limited food knowledge, Laurie decided to study cooking at The Culinary Institute of America after getting her Bachelor’s degree at New York University. Laurie worked in restaurants until she met her husband-to-be, photographer Bruce Wolf. He told her about food styling, which was not yet part of the curriculum at cooking school. She apprenticed for a year and worked for many well-known food and lifestyle magazines for many years, eventually becoming a food editor for “Mademoiselle” and then “Child” magazine. In 2008 Laurie and her family moved to Portland, partly drawn to the exploding food scene. She spent the first couple years in Portland researching the book she didn’t know she’d be writing, trying out the top restaurants and shopping at all the farmer’s markets. 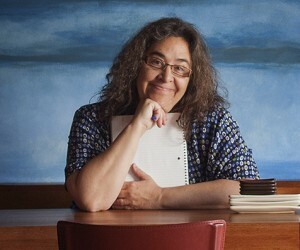 As good fortune would have it, Laurie was hired to write the local edition of a series about “foodie” towns and in July, “Portland, Oregon Chef’s Table” was released.